There have been recent changes here at The Wine Advocate. Anthony Mueller, a second-generation Arizona native, has joined the reviewer team, taking over responsibility for the regions of Washington State and South Africa. Wine, too, became a passion for Mueller. In 2011, he challenged himself with rigorous wine exams to test his knowledge and skillset. In 2014, he took his first stab at the Advanced Sommelier Exam through the Court of Master Sommeliers—and failed. “I realized I needed to become part of a larger wine community in order to achieve my goals,” he says. So, he moved to a wine and culinary hotbed: Napa. And that’s just the tip of the iceberg. Mueller holds numerous wine certifications, including the aforementioned Advanced Sommelier certificate from the Court of Master Sommeliers, the Wine & Spirit Education Trust Level 3 Award in Wines, the Certified Specialist of Wine from the Society of Wine Educators and the Certified Sake Adviser certification from the Sake School of America. He’s currently prepping for both the Master Sommelier and Master of Wine exams. When he’s not studying, Mueller can be found attending various concerts (ranging from Slayer to Sarah McLachlan), riding his motorcycle through wine country, traveling and gardening, a new hobby of his. What excites you most about your new position? I am super excited about my new position as a reviewer for Robert Parker Wine Advocate! I love wine, I love to travel and I love to educate and inspire others about wine. My job involves tasting lots of wine, traveling to wine regions and teaching people about wine—a dream job for anyone in the wine business. I am excited to be surrounded by such a talented team of wine professionals. Wow—I’m a super lucky guy. What was the last thing you cooked for yourself? I have all of the fun kitchen gadgets. I like to create simple dishes full of flavor on a daily basis. Most recently—of all places, at the office—I shared a simple recipe for making Caesar dressing from scratch, something I learned from Thomas Keller himself. The last dinner I was really proud of was a five-course meal shared with friends. The main course was a three-pound Tomahawk chop, which I cooked sous vide and finished in a cast-iron skillet, served with homemade sauce Bordelaise, five-cheese potato gratin with pancetta and garlic and pan-seared broccolini. I have a passion for a wide range of cocktails. It really depends on my mood and present company. I love classic cocktails like the Negroni, the Aviation and a Manhattan, and I think every moment is acceptable for an Aperol Spritz. I tend to run warm, so frozen drinks always make me happy. If I see a cocktail with Sherry in it, I will order it every single time. I have studied mixology and crafted a few originals of my own as well. In your opinion, what restaurant has the best wine program? There are so many things that make a great wine program. The wine list has to be thoughtful, relevant to the cuisine and should be easy to read—and if it’s a large list, there should be a sommelier there to offer help with selections. A few restaurants with great wine programs that come to mind are Eleven Madison Park in New York City, Bern’s Steak House in Tampa, Commander’s Palace in New Orleans and The French Laundry in Yountville. All have amazing wine lists to cater and pair beautifully with their cuisines. These wine lists play like a “greatest hits” album of the finest wines on the planet. If you weren’t a wine reviewer, what would you be doing? I would still be in the wine industry. 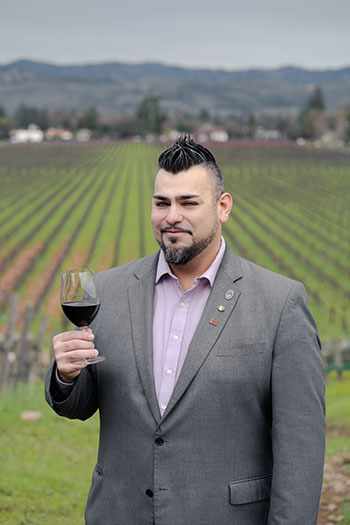 Before joining The Wine Advocate, I was the Château Ambassador for Inglenook in Napa Valley, educating visitors about the estate. I’ve learned that mentoring and teaching others about wine makes me truly happy. I have taught and lectured about wine throughout the U.S.—if I wasn’t a reviewer, I’d still be teaching people about wine.